Saturday’s governorship election in Anambra is expected to be a close contest between four leading candidates. However, there are 37 candidates in the election including five women. Here are 10 major things to know about the coming election as well as previous elections in Anambra. The Centre for Democracy and Development, CDD, in partnership with PREMIUM TIMES will bring you a comprehensive coverage of the election. The politics in Anambra State is the case study for Godfather Politics in Nigeria where the quest to hold on to power with so much enthusiasm by politicians is on the increase. From the Fourth Republic, the state has witnessed these ugly trends as political actors and their estranged political godfathers are always in contention for control of state resources. For each electoral cycle, there is a godfather. The political brawl (which could be said to have birthed godfatherism), in Anambra State began with Governor Mbadinuju and Emeka Offor. The trend continued with the inception of Governor Chris Ngige and his political godfather, Chris Uba; a crisis that caused a lot in the polity of the nation and Peoples Democratic Party (PDP) in particular. Each of the front liner candidates in the Saturday elections is already linked to a godfather. However, the fight between Peter Obi of PDP and Willie Obiano of APGA, will partly define the electoral outcomes. Virginia Etiaba: From November 3, 2006 to February 9, 2007 APGA. (Appointed when the previous governor, Peter Obi, was impeached by the state legislature for alleged gross misconduct. She transferred her powers back to Peter Obi three months later when an appeal court nullified the impeachment). Peter Obi: From February 9, 2007 to March 17, 2014 APGA. (Andy Uba was elected and sworn in as the governor of Anambra State on 29 May 2007. He was removed by a Supreme Court decision on June 14, 2007. He governed the state for 14 days). Anambra State is the only state that paraded five governors under controversial circumstances from 1999 to 2007, including one who spent just 14 days in Office. The matter of zoning or power rotation – where elected positions rotate between different geographical areas – has emerged as a major factor in the campaign for the Anambra State November governorship election. The popularity of zoning in Anambra State politics was developed while Peter Obi was rounding off his eight years in office as the governor of the state. It was initially dismissed by his political opponents as a non-issue in the Anambra governorship election. Many stakeholders in the state are, however, beginning to realise that it is the only way to ensure equity and fair play among the three senatorial zones. In the run up to the 2017 governorship election, the issue of zoning prevailed in all the major political parties in the state. 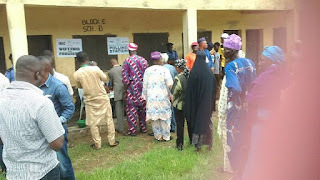 The three major political parties, the All Progressives Grand Alliance, APGA, (with Willie Obiano as its governorship candidate), the All Progressives Congress, APC, (with Tony Nwoye as its governorship candidate) and the Peoples Democratic Party, PDP, (with Oseloka Obaze as its governorship candidate), have all zoned their governorship candidate to Anambra North. This has set the stage for a bull fight in the upcoming governorship election in November. The Indigenous People of Biafra, IPOB, has threatened to stop the November 18 elections by utilising the strategies of community evangelisation, awareness raising, rallies, posters and circulation of text messages. Earlier proscribed by the government as a terrorist group and barely a week to the governorship election in Anambra State, members of IPOB, on Friday, November 10, marched around some streets in Onitsha, Anambra State, chanting :“if you vote you will die. Don’t go out, stay in your house,” They vowed not just to disrupt the elections but also ensure a lockdown on the day of the election on Saturday, November 18. The IPOB leader, Nnamdi Kanu, whose whereabouts remain unknown, earlier said that unless the Nigerian State calls for a referendum to determine the status of the country, no election will be held in Anambra State or indeed the South-east in 2019. The Idemili North State Constituency in Anambra State elections will be held alongside the governorship election on November 18. The following areas are considered battleground in the state, including Idemili South and North Local Government Areas. Notwithstanding, contest for vote will be stronger in local government areas in Anambra South Senatorial district. This is because no candidate from the three major political parties emerged from there. The three major parties are expected to focus more in the South for votes during their campaigns and election. There are 37 political parties running in the elections with five identified as frontline candidates. They are Oseluka Obaze (PDP), Tony Nwoye (APC), Osita Chidoka (UPP), Ezemuo (PPA) and the incumbent governor Willie Obiano of APGA. Anambra State is the first to have 37 candidates contesting for a governorship position in an election since the history of elections in Nigeria. Since the inauguration of the Fourth Republic in 1999, governorship elections in the state have never witnessed up to 50 per cent of voter turnout except in 2007 which was massively rigged. A review of the voter turnout since 2007 reveals a progressive decline in voters’ turnout. By INEC’s election result, 1.84 million registered voters existed in Anambra State for the 2010 governorship election. Only 302,000 voted, a miserly 16 per cent voter turnout. In 2013, a total of 1, 770,127 were registered, but only 465,891 voted, representing 24 per cent. This means that women make up only 13.5 per cent and 21.6 per cent of total number of candidates vying for governorship and deputy governorship positions respectively. Except for PDP, none of the other major political parties has a female candidate. According to the Independent National Electoral Commission, INEC, about 2,158,171 million people in Anambra have registered for the November 18 governorship election. INEC further revealed that 50.3 per cent are females while 49.6 per cent are males. Also, the highest voting population are students who make up about 48 per cent of registered voters while Idemili North Local Government Area has the highest number of registered voters. The Nigerian Police have deployed about 26,000 police officers to Anambra State ahead of Saturday’s election. The state initially had 5,000 police officers who are now to be joined by 21,000 others from neighbouring states. The deployment is to ensure the forthcoming election is free and fair, the police said. The security personnel and equipment deployed include Police Special Forces, Police Mobile Force, the Counter Terrorism Unit, CTU, Special Protection Unit, SPU, the Anti-Bomb Squad, EOD, the Force Marine Police, Conventional Policemen, the Force Armament Unit, personnel from Force Criminal Intelligence and Investigation Department, FCIID, Mounted Troops, the attack and Sniffer Dogs Section, Police Gun Boats, Police Helicopters and Armoured Personnel Carriers, APC. Party primaries conducted ahead of the November 18 governorship election is a watershed in the history of elections in Nigeria’s fourth republic. Since the return to democracy in 1999 in Anambra State and Nigeria in general, there is hardly a time of absence of court cases after governorship party primaries to challenge their outcomes. For this election, primaries were concluded without any court case. Internal mechanisms were promptly deployed by leadership of several parties to address any crisis that emerged from the primaries.